Raising Calves: How To Maximize Their Growth Potential! Understand how calves work, and you’ll soon be ruining the elastic in your socks. 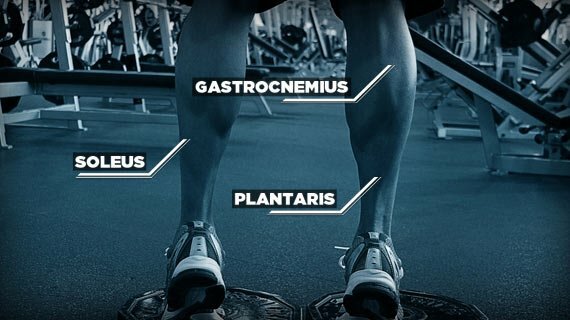 The calves are among of the most difficult muscle groups to develop because of two factors: training and genetics. Mom and Dad, you're stuck with; training, we can help with. The gastrocnemius is the biggest; it has medial and lateral heads. This is the visible muscle at the back of the lower leg. When fully developed, the gastrocnemius has a diamond-like shape. A person can either have a high-inserting or low-inserting gastrocnemius. A high insertion means the muscle belly is shorter; a low insertion means longer. This is due to genetics and cannot be altered through training. Therefore, a person with a high insertion will find it more difficult to develop the gastrocnemius and may never the development of a person who has a low insertion. Don't be discouraged. With proper and consistent training, the gastrocnemius will grow, no matter the insertion point. Just be realistic and mindful of your genetic limitations. The second muscle down there is the soleus, which lies deep underneath the overlapping gastrocnemius. The soleus is only visible from the sides of the lower leg. The role of the third member of the trio, the plantaris, remains up for debate. It's a small muscle that originates behind in the back of the knee and then is completely concealed by the gastocnemius. The plantaris muscle becomes the plantaris tendon as it runs the length of the calf and attaches to the Achilles tendon. The plantaris has a high density of muscle spindles, which leads some to believe it performs a proprioceptive function in the calf. (That's a big word, but it simply means the plantaris may be the "watchdog" of the lower leg, sending messages to the brain to let it know where and how the calf moves). Now that you understand the anatomy and function of the calves, you need to learn how to train them. A common belief is that the calves need to be trained every day. Um, not! This will surely lead to overtraining and hinder your calf development. At the same time, the calves should not be trained as an afterthought. Randomly do only a couple of sets of calf raises once a week, and your calves will be similarly uninspired. These calves are gym-built, not farm-raised. Instead, train the calves one to two times a week at the beginning of your workouts. Perform three exercises per calf workout, two of them straight-leg calf raises, the other exercise a bent-leg move. Each exercise gets three sets. Use a combination of low and high repetitions in the range of 10-to-25 reps, taken to muscular failure. This routine is best because if you stick to only one rep range, you'll limit your growth potential. Every couple of workouts, incorporate intensity techniques such as drop sets and negatives to keep the training from growing stale and to maximize your progress. Learn more about Richard's new book "The Human Statue Workout"